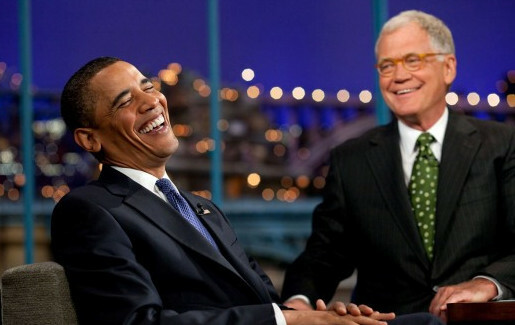 Barack Obama talks with host David Letterman on the set of "The Late Show With David Letterman," Wednesday, Sept. 10, 2008. It was Obama's fifth visit to the show. Barack Obama is one busy man. The President of the United States made his second appearance on The Late Show with David Letterman since taking office. After chatting with Dave, POTUS hit up Jay-Z and Beyoncé's $40,000-per-person fundraiser at The 40/40 Club in New York City. David Letterman asked Obama on his thoughts of Mitt Romney's leaked controversial comments referring to "47 percent of Americans," to which he said, "One of the things I learned as president is you represent the entire country. If you want to be president, you have to work for everyone. "This is a big country. And people disagree a lot, but one thing I've never tried to do and I think none of us can do in public office is suggest that because someone doesn't agree with me that they're victims or they're unpatriotic...There are not a lot of people out there who think they're victims. There are not a lot of people who think they're entitled to something...We've got some obligations to each other, and there's nothing wrong with us giving each other a helping hand so that that single mom's kid, after all the work she's done, can afford to go to college." Later, hosts Hov and Bey introduced the president, who spoke to about 100 people that were enjoying wine, champagne and finger food. 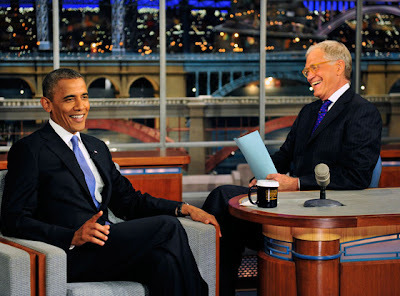 It will be the second time Obama has appeared on Letterman since taking office. The first time was in September 2009. "I can't tell you how proud we are to host tonight's event with President Obama," Beyoncé, rocking a red cocktail dress, said. "We believe in his vision." Barack thanked "J and B" for their kind words and their friendship, and said, "Beyoncé could not be a better role model for my girls." He also proceeded to draw connections with Jay, saying, "We both have daughters and our wives are more popular than we are. So, you know, we've got a little bond there. It's hard but it's okay." Outside the 40/40 Club in Manhattan, where President Obama attended a fund-raising event hosted by Beyoncé Knowles and Jay-Z on Tuesday. Obama then continued to share with the guests at the event that he wanted a "more fair, more just" world. "Here in America you can make it if you work hard," and added, "I don't want people to be complacent but I don't want people to be discouraged. "We've made history in the past and we're going to make history in the next seven weeks."